" all over again. On each occasion you see the image from a different point of view because of the space of time involved and well just knowing how often things can change. As I looked over each negative I saw many variations taking place on the light table with each pose and circumstance that was captured and then too, I remembered what I was thinking when they were taken. 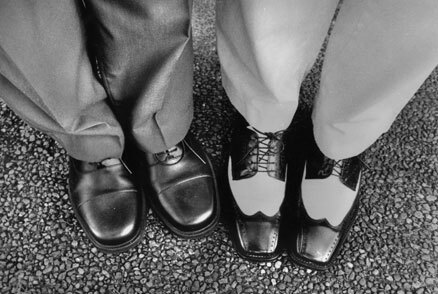 As I watched this picture developing I wondered, that if I hadn't known these shoes, could I see either foot belonging to a father or son? This particular pairing could have come from the Norman Rockwell era and as I revisited this picture from that potentiality the fancy dress shoes belong to a young dashing dad, a junior executive "on the rise." His big boy, next to him, wears a basic everyday shoe and has pants that speak of a busy day. Or perhaps If now, the "other shoe"
were to fit, we would see an elderly retired man wearing a very well polished, yet plain and sturdy dress model. Alongside, his middle aged son wears his personality on his two toned wingtip showboat shoes that are much bigger than life.